Chris Dalliston is clothed in his cope as Dean of Peterborough Cathedral. 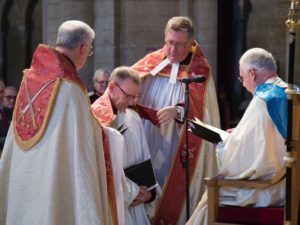 It was a day of celebration at Peterborough Cathedral on Saturday afternoon (20th January) as the Very Revd Chris Dalliston was installed as the new Dean of Peterborough. The new Dean’s installation was attended by hundreds of worshippers, including the Mayor of Peterborough, the Lord Lieutenants of Northamptonshire and Rutland, and representatives of other faith traditions. Whilst the weather on the day was decidedly wet and miserable, the service inside was a real contrast, with beautiful choral pieces and readings from Acts 10 and Luke 22 accompanying the ceremony. Prior to the service, the Dean Designate (as he was then) made oaths and declarations in the presence of Bishop Donald, the Chapter of the Cathedral and the College of Canons. He was then presented in front of the congregation to Bishop Donald by the Bishop of Newcastle – the Rt Revd Christine Hardman (the new Dean’s previous post was Dean of Newcastle) – and was then clothed in his cope as Dean of the Cathedral by the Revd Canon Tim Alban Jones and the Revd Canon Ian Black (the residentiary canons of the Cathedral). Members of Peterborough City Council, the Peterborough Cathedral Development Trust and the Cathedral congregation also welcomed the Dean Designate using the three strands from the Cathedral’s mission and development plan – promoting wonder, celebrating faith and taking risks in the service of Christ. After the Dean Designate had made and signed the declaration to become Dean, Bishop Donald contrasted in his sermon the pomp and ceremony of the installation with the sacrifice of Jesus. Describing the Cathedral as “the icon of Peterborough”, he stated that “the building stands to show that leadership is service – to give yourself to Christ”.